Page edited down 2003/06/09 by Charles Matthews. To see other contribution see older versions (up to version 32). mAsterdam ...I do think that a Beginner page on liberty should only offer one meaning. Charles I think this is what I have said from the start. Just a point though: the 'capture metric' sense isn't loose at all, but it's a book-length discussion. BobMcGuigan: I see the problem of "secondary liberties" as being, yet again, a matter of context. I like best the idea of "moves to capture" because it encompasses everything with one term and factors in the context. Given the bizarre shortage-of-liberty shapes that can occur near the edge it might be necessary to make a move 10 or more spaces away from a group in order to capture it. In other words this is a property of a position rather than a group. Some of the same issues come up in approach move kos. There, too, the key idea is number of moves needed to reach a certain state on the board. Charles I have to say that in introductory writing on go, using 'group' sometimes to mean chain and sometimes not, is disastrous. Not so for most players. Isn't this the same kind of distinction? If you make the liberties of the stones depend on those on the stones (which are in the same group, naturally), you have also to answer such questions as : in a capturing race, does White need to save the chain? Bob's suggestion that we need position-context, which is quite true, makes a third level chain/group/position. Bill: I agree that it is like pears and apples, or at least like different varieties of apples. HolIgor: Perhaps, because I come from the country where chess is very popular, I always understood and called what as named here as "secondary liberty" as tempi. White's group has two liberties but three tempi to capture. On White's turn, White wins the capturing race. 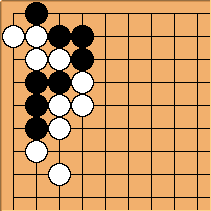 On Black's turn, Black can form a group with three liberties but four tempi to capture, because White cannot attack from the corner. Her group has only two liberties. Shortage of liberties. Charles I would never mention 'secondary' liberties to complete beginners; then you certainly need the shortage of liberties concept to study tactics at all seriously, and the approach move is a good example at this point. For players around 10 kyu, perhaps, thinking of 'extra' liberties caused in certain ways should be clarifying. So here, with the pedagogic purposes we have on certain pages, we can talk about secondary liberties as a kind of working concept - not very computable or at least not trivially computable. Richard Hunter I use physical liberties for the actual points adjacent to stones and then add approach moves to get the liberty count, which is how many moves it takes to capture the stones. Bill Are we justified in calling such moves liberties? Yes, indeed. Consider a dame liberty. As long as a chain of stones has at least 1 of them it stays on the board during play. Why do we count more than 1? Very simply, to capture the stones unless they are added to, the opponent must fill each of them. The dame count tells us the minimum number of moves he must make to capture them. The reason for counting liberties has to do with that fact. So the underlying idea in talking about liberties (plural) rather than simply a condition of being captured vs. not has to do with how many plays it will take for capture. Such plays are rightly called liberties. You have to inform the beginner about capture, and so must tell her about dame. In English, you call them liberties. "A stone or chain may be captured by filling its last liberty." (Sebastian:) The page Liberty - Introductory should be consolidated with Liberty. I don't see why there are two pages. If you click on a link called liberty, you expect some introductory remarks. Bill: Liberty is a reference page. We had a good bit of discussion about this, and the idea is that introductory material, aimed at novices, is often better presented without all the niceties and complexities that are appropriate for reference pages. Charles Sebastian, I agree with you. You have to understand that I backed down on this issue, rather than have an edit war with Bill on this. A notable incident in the rather peaceful SL annals. Bill: I'm sorry you feel like you backed down, Charles. I thought that the idea of separating introductory and reference material was a new one that arose out of the (rather heated) discussion, and was a creative solution to an impasse. Charles Beyond presenting it that way for the sake of quiet, I think it was a poor solution. The normal way with ambiguous terms such as liberty is to give each sense a separate page. I think the insistence (Bill's) that both senses be on one page is a bad precedent. That's above the procedural point on how it all happened. I say firmly again - wikis are for editing; in effect Bill got his way by huffing and puffing; it happened again recently; and doubtless will continue to do so if I can be bothered to try to edit SL for useability. As for there being different pages for different senses of words, I have no objection, and have, I believe, even created such pages. However, I do not believe in having only one of the various senses being on a definitional page, with the others relegated to subsidiary pages. Give each sense a separate page, fine, but do not favor one or the other by having it alone on the main page. I thought your main point was that you did not want novices to get confused. Having introductory pages addresses that concern. Charles Bill, what you did was to restore the page as it was before my edit. And before most people had the chance to see what that was. I don't recall that anyone actually supported you, even so. Someone else's material - you do really think that you have ownership of what you post here, don't you? You are simply in the wrong there. That point of view is not supported by the terms under which posters post here. You have the right to have your contribution acknowledged, if edited into something bigger. That's it. You method of 'defending' 'your' material is unacceptable to me, when it involves (as in the case of liberty, and recently of work) posting here at ten times the length of the initial page. As if the work of the site could go on if everyone was so territorial. You had your Pyrrhic victory over liberty - I took my more sensible line to another page. Now, when we are asked, should shortage of liberties link to liberty, what do I say? It could link to liberty, but the confusion would remain. That's because the ambiguity of liberty rests on a linguistic fallacy. It is clear enough that if 'liberty' in 'shortage of liberties' were a separable concept, it would be the second sense that applies. But it's not a separable concept. If you are 'short of breath', that doesn't really mean that you can quantify the breath you are short of: it means you have trouble climbing the stairs. If you are short of liberties in a capturing race, it shouldn't imply that there is a definition of liberty which applies to what you are short of. As anyone can see after a while, a capturing race can in practice involve most kinds of shortage of liberties, as generalised approach move phenomenon. I don't see the point of some of the other picky discussions over words, if this kind of issue is 'hands off'. So, it seems to me that a straightforward comment from Sebastian brings the whole debate back again. No closure there - just a compromise on my part in the teeth of a barrage of arguments from Bill's supposed authority and tenacious upholding of quite imaginary rights to have his own way here. Bill: Just a brief comment, Charles. I did not restore the page to what it was before your edit. Anyone can view the page history to verify that. I did a Wiki Master Edit as a result of discussion and consultation. in a spirit of collaboration. I attempted to see that the WME did justice to the contributions and viewpoints of all the authors. I did not set myself up as an authority. I do not see what happened in terms of victory or defeat. It was not a contest, but a collaborative process, in my view. My attitude was one of collaboration, and remains so. Bill: I object strongly to the editing of the Liberty page. It is one thing to add a discussion page. It is quite another to hack up an existing page. As one of the original authors, I object! Charles Well, I naturally saw this as a way forward. The way back, by restoring an old page, exists here too. I wouldn't call reopening a master-edited page, after six months, for more development or subdivision, so hasty. mAsterdam: This escalation was not at all what I had in mind when I shared the difficulties I had in trying to understand what some authors mean by secondary liberty. Should I begin to feel sorry or is this just something inevitable at a Wiki? Charles As I understand the wiki concept, editing is as inevitable as death or taxes. It depends on what kind of editing. The basic wiki concept is 're-factoring'; calling a WikiMasterEdit implies a certain finality. But SL is too young, surely, for that. I certainly mean no offence to Bill or anyone else. But the 'secondary' aspect of liberties needs more examples to make its scope comprehensible to the newcomer - approach move is a potentially complex idea in the worst case. I have supplied a number and many more could be given. I'd like to see that concept opened up further, and then return to the wording of liberty sense 2. On the whole, and without prejudice to the particular case of the page in question, there is too little editing here, I'd say. Many discussions remain in 'thread' form. Bill: While I agree that there are many pages that need editing on SL, it is also true that there are many poorly edited pages. One principle of creating (and editing) hypertext is that you cannot assume that any page will be read in sequence. Even if there is a sequence at the moment, that can change at any time. Rather, you must assume that the reader comes to the page with zero context. You must therefore include enough context in the page or by links for it to make sense, preferably the former. This means that hypertext documents perforce should be more redundant than regular text, which is about 50% redundant, to start with. This is in opposition to the idea of factoring, which reduces redundancy. So, I didn't want to restore the original page - Bill did, eventually. put the onus on me to restore. I'm glad I didn't restore. I think these are all classic conservative tactics, and I object to them. We ended up needing a beginners'page. I think your approach simply ignored the requirements of beginners. This point was first raised here in February - when Bill was saying that dame should be used for liberty sense 1. Since dame is overloaded, that would make matters much worse. I backed down then. It flared up in a major way in June. Here we are in November. It looks like we shall have to go over it all every four months or so, until we get the material edited into much more useable shape. I see that Sebastian has started editing liberty again. (Sebastian:) Yes, I started, but I'm done for now, and I do hope sincerely that it finds both your approval. I primarily separated the pages, since this seems to be something both of you agreed with. Charles If you think that, you haven't read what Bill says with care. (Sebastian:) Who wrote "As for there being different pages for different senses of words, I have no objection", then? Charles I suspect, in the light of the qualifying sentences following that one, that Bill will consider that the choice of pages [[liberty - introductory] and (now) liberty (tactical sense) in fact favours the former meaning. I know that we'll find out. I expect this is an edit war in the making. Well then, we see if SL survives that. Bill: I have taken a quick look at the current Liberty page. It looks very much like I was going to suggest, once I found out that you were still unhappy, Charles. :-) I would have thought that you would object to it, since it does not favor one sense of the word over another. Charles, I haven't (as I originally intended) reconciled the empty point page with liberty - introductory. I don't dare to touch this yet, but it should be easier now that it is clear that we have the dedicated empty point page. I am sorry that I opened this can of worms at this time, when there are still some emotions in the air. I want SL to prosper, and since the two of you are the main pillars of this site, I would rather see you devote your energy to good contributions than to warm up old fights. Charles Well then, you could proceed with greater tact in future. Note that I don't imply you have done anything wrong in this. (Sebastian:) I think I am tactful whenever I deal with people. What opened the can was my statement about a page ("The page Liberty - Introductory should be consolidated with Liberty. I don't see why there are two pages.") Do you mean, I should be wary to make statements about pages, for fear they might wake up someone's feelings of resentment from the time before I was here? Charles Well, you could try asking questions, rather than making statements. For example. As it happens, complaints about your editing habits have reached me offline - and I have stoutly defended your right to ask questions here, and not be bullied out of editing. On the other hand, I think that makes me the person to mention to you that the feeling obviously exists that not all your time on SL is well spent. So, I have said it. I still defend your right to edit, and to ask away. On the other hand, what would Go be without a fight, and what fight could be more noble than the fight for Liberty? I mean this not just metaphorically. There are more than 500 pages that deal with liberty, so it is a very important term. The fact that there is a confusion is not your fault, but it needs clarification. As evident from my confusion on The bamboo joint may be short of liberties (old name was 'The bamboo joint isshort of liberties') , it was not clear yet. So please go ahead and feel free to edit what I changed, or rename (via alias) if you don't like the new page titles. I won't interfere for the next 32 hours. Charles My line is that we can all edit; and are all responsible for what we do. I expect this will use up quite a number of hours of my time, to deal with.